Yrsa Daley-Ward, a traditionally published poet, attracts quite a crowd to her poetry readings at bookstores. How did she gain this popularity? One word. Instagram. She’s one of a growing breed of poets who uses Instagram and has been referred to as Instapoets. Most Instapoets are self-published, such as Lang Laev (1 million+ followers on Tumblr), Robert Drake (1.3 million Instagram followers as of three years ago), and Tyler Knott Gregson (335,000 followers on Instagram). And as of last week, Instagram now has 1 billion users. The New York Times reported that Instagram poets vary the way they use the online network. Below are examples of some of Daley-Ward’s Instagram posts. In this post, she shares a poem from the printed page of her book. In this post, she encourages people to attend an event. Sign up for Tumblr. Add your blog posts, poetry and images. Remember to keep it simple, don’t be afraid to show your true personality, join conversations with readers and other poets, and above all, be visual. Post daily. Sign up for or step up your presence on Twitter. Send five tweets daily, tweet your poetry, engage with readers, and use the hashtags #poetry, #poem, and #haiku. Refer to your Instagram posts on Twitter with the hashtag #Instapoet. Check out these posts to learn more: Grow Your Twitter Tribe with These Tips, 10 Things Authors Should Never Do on Twitter, and Advanced Twitter Tips for Authors. Some poets, such as Gregson, find Facebook helpful as well. Add visually appealing text-based posts, like the ones shown above, at least twice a day. In addition, notify your following of upcoming readings and signings. Check out these posts to learn more: Learn How to Create Shareable Facebook Contentand Do Authors Really Need a Facebook Page? What If You’re Not Strictly a Poet? Are you wondering how the same fame that these poets have achieved could possibly apply to your career? I’m sure you’ve written a couple of poems in your life; I know that I have. So why not put them on Instagram, Twitter, Tumblr or Facebook? Who knows what might happen? 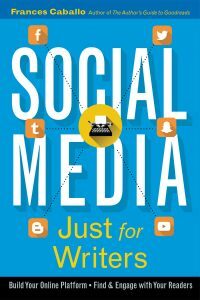 Learn more about Instagram, Twitter, Tumblr, and Facebook in my new edition of Social Media Just for Writers! This week’s Indie Author Update is chock-full of posts ranging from blogging to Twitter to Amazon ads. I hope you enjoy the diversity of posts. On a personal note, I’m pleased to see the cold of winter fade as spring bounces back. Where I live, the temperature has risen to the low 90s and I’ve enjoyed the sun. How’s the weather where you live? If you’re just starting out on social media, it may seem overwhelming. Even if you’ve been using it for a while, the prospect of staying up to date on numerous social media platforms may seem like a full-time job. There definitely are learning curves to social media. That’s a given. But social media needn’t be overwhelming. Take it from someone who works in social media every day. As the joke goes, How do you eat an elephant? One bite at a time. Take the same approach to the social media networks you want to learn and keep up with. This past week was rich in terms of content on the blogosphere. I hope you enjoy this week’s social media updates for authors. But first, here’s the story about the above image. Here’s a little-known fact about me: I hike every Saturday morning, even in the rain. It’s a ritual I refuse to relinquish. The woods is where I replenish myself. Recently, I heard indie author Mark Dawson say that all the writers he knew were walkers. Well, count me as a member of that group. This past weekend, I slipped my iPhone into my back pocket and, of course, silenced it. I intended to take pictures of the wildflowers growing in Sugarloaf Ridge State Park. I did take pictures of lupines, paintbrush, and monkeyflower, yet the above tree was my favorite subject. One never knows where the path will lead or where intention may be diverted. But if my experience last weekend can be seen as a metaphor, then it’s this: Don’t be rigid in following a path or pursuing an intention you think is best for you. You’re a writer, an artist. Follow your intuition and you’ll always be on the right course. Note: Until this post, I hadn’t heard of anyone discussing psychographics in terms of readership. This is the definition the author offers: “the study of personality, values, opinions, attitudes, interests, and lifestyles.” This was an informative post with a new perspective.